Back in 2012 we got very excited about the opening of Palazzo Margherita – the latest addition to Francis Ford Coppola’s expanding stable of award-winning resorts. A couple of weeks ago we, at long last, had the opportunity to check it out first hand and found out why everyone has been so excited about this fabulous Coppola Hideaway. Situated in the beautiful town of Bernalda in the Basilicata region of Southern Italy, this is yet another superbly stylish, tranquil and eco-friendly getaway, and one which characteristically reflects the director’s rather fine eye for detail. Whenever we visit one of Francis’s resorts, we are always hugely impressed by his obsessive attention to detail, humour (think conch phones at Turtle Inn, his resort in Belize for instance) and his imaginative displays of work from local artists which creates such a unique ambience. Many times we have stayed in the most oppulent, and yet over stylized hotel, with no sense of character that could be literally anywhere in the world. With Francis’s resorts, you always know exactly where you are. Take for example La Lancha in the Guatemalan jungle. The casitas are painted in plain white, providing a perfect background for the riot of colour supplied by the native art furnishings and lashings of glossy natural wood. It would be easy for Francis to leave the decor to a team of designers, but he never does. Together with his wife Eleanor, they’re very much a hands on team and regularly visit local markets and artisan studios to personally select art and fabrics. The result is more home than hotel. Here, the 19th century palazzo, built in 1892 has been completely renovated in partnership with acclaimed French designer Jacques Grange and as one can expect, offers a luxurious yet authentic Italian experience right in the charming town of Bernalda (birthplace of Francis’s grandfather, Agostino Coppola). This is in the hitherto relatively undiscovered region of Basilicata (just over the arch of the Italian boot) and with the nearby stunningly beautiful Unesco city of Matera set to be European city of culture next year, we are sure to hear more in the future. The interior is styled with tiled floors and hand-painted fresco ceilings with a taste of Moroccan and Baroque flair. All the floors have been restored using local marble with additional craftsmanship provided by painters and artisans in the region. Our favourite was Francis’s personal suite with its style intended to honor his Tunisian-born grandmother, Maria Zasa. A blue-white zig zag tiled floor is a bold design feature, with a striking tiled fireplace and an anteroom with a large writing desk. Walls and high ceilings feature beautifully restored paintings and frescos. Food is always a big deal at a Coppola resort and Palazzo Margherita is no different. Inspired by the regional Italian cuisine, and prepared by chefs versed in the traditions of home cooking: hand-made pasta, local game and fish from the nearby coast. 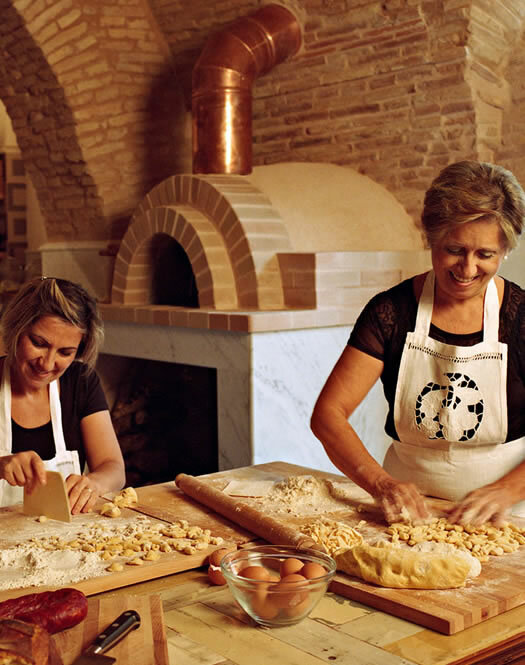 For foodies and cooks, there’s even an opportunity to sit around the large farmhouse table and participate in a daily class given by the chefs, demonstrating how to prepare typical regional dishes. Spa services are also available for those in need of a little pampering and in the evenings, the Palazzo’s salon becomes a private screening theatre. A giant chandelier is cleverly hoisted up, a screen slides down and, hey-presto, guests can enjoy one of Francis’s personally curated collection of 300 classic Italian films and documentaries. More recently younger members of the family have started contributing to the Palazzo’s story arc—Sofia celebrated her wedding in the garden in 2011, and Roman’s son ate his first birthday cake in the courtyard. It is easy to fall in to the family atmosphere here with the relaxing and airy bedrooms, lazy breakfasts in the courtyard, cappuccinos in the hotel’s own Cinecitta Cafe and alfresco lunches at local farms. We recommend combining a visit with a stay at Matera (see our review of Sextantio – La Grotte della Civita here). All images by Palazzo Margherita.